TORONTO, March 16, 2018 – Whether you believe in luck or not, the Irish certainly do. Or at least that’s the case when it comes to an Irish couple by the names of Nicki Brolly and Brian Mc Connell, who took a leap of faith last year when they decided to leave Ireland to work abroad in the horse racing industry. “I was actually at the fortune teller and she said, ‘You should go to Canada or America, you will really like it.’ So I was like, ‘Let’s go to Canada!’” said Brolly, who grew up in Donegal, the northwest part of Ireland. After booking flights and organizing visas, the couple began searching for jobs within the racing industry and soon found themselves in contact with trainer Catherine Day Phillips. In March 2017, they began working for Day Phillips, hot walking, grooming, mucking out stalls, feeding and getting horses ready for race days; both were tasked with taking care of five horses each. “I never worked with a horse until I came to Toronto,” said Mc Connell, who is also from Donegal and worked as a mechanic before moving to Canada. However, knowing Brolly was game to work in the industry, he followed suit without much hesitation. Brolly is quick to note that Day Phillips provided the necessary training her partner needed, despite his lack of experience. Little did they know how fortunate they would be to work alongside some of the major players in the 2017 Woodbine racing meet. Brolly groomed stakes winner Dixie Moon, as well as Mill Road and Smooth Talk, while Mc Connell worked with horses such as multiple stakes winner Mr Havercamp, Grace and Dignity and Tombelaine, who is part owned by R & B singer Jason Derulo. Even though it wasn’t Dixie Moon’s day to shine in the spotlight, she not only finished a solid sixth in a large field of 14 fillies, but did it in front of a roaring crowd of over 30,000 racing fans. 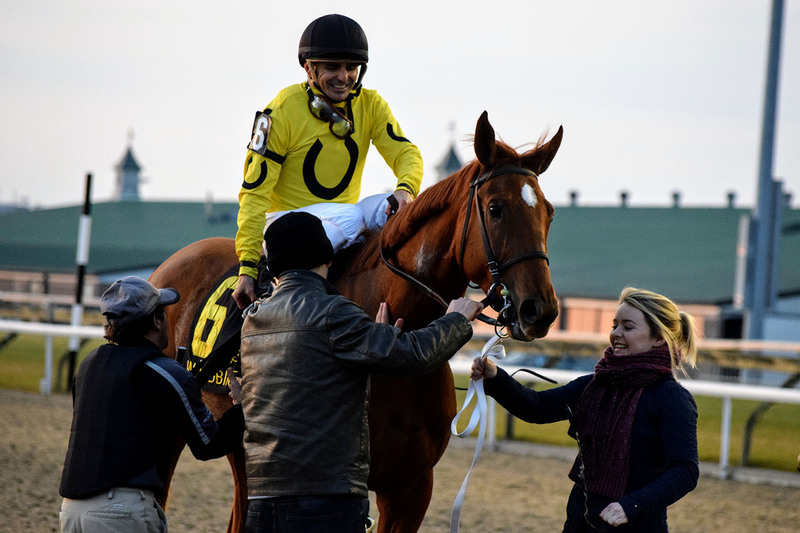 “You just have to go there to feel the atmosphere and everything,” said Brolly, who is still in awe of her first Breeders’ Cup trip and proud of her filly, who came back to Toronto to capture the Ontario Lassie Stakes in December. Working alongside their four-legged counterparts for a better part of a year, the couple have not only bonded with them but also have a sincere appreciation for the process that goes into grooming these athletes for their prospective careers. “You get them your first day. They are two-year-olds or maybe they are unraced three-year-olds and you start them from day one and you work on them. Then you carry them through and then all of a sudden they are running in stakes races and they are winning, or they are going to the Breeders’ Cup, or they are just going out and performing. Our horses run so hard and I think they try so much,” said Brolly. While Brolly knows it takes a lot of hard work to get a horse ready to run, she also admits to having a few personal rituals in place before sending a horse out for their race day. “It’s actually kind of funny. I would bless them with holy water. I swear to God, I would bless them with holy water and Catherine has her own ritual that she does. And then we’ve got holy Mary medals and we rub them with holy medals – it’s kind of a necklace to be fair,” said Brolly, who brought a little stock of holy water from Ireland when she came last year and again when she was home at Christmas. Settled into their racing family, the couple is looking forward to celebrating St. Patrick’s Day at the barn. The Irish couple is currently working with Day Phillips in Florida, but will be returning shortly to Woodbine in preparation for the 2018 meet beginning in late April. Day admits there is one pit stop for some of her horses before they head home to Ontario. She is also looking forward to some news digs upon her return to the backstretch. “We are actually moving to a new barn, which is very exciting. We will have more horses this year – we have 41 stalls this year versus 30 from last year and we moved barns so that we could have all the horses under one roof, which is important to me, not to have them split up over more than one barn or two barns. A seasoned conditioner at Woodbine, Day Phillips is nominated for Outstanding Trainer at the 2017 Sovereign Awards. Additionally, Dixie Moon is a finalist for Champion Two-Year-Old Filly, while multiple stakes winner Mr Havercamp is up for Champion Three-Year-Old Male. Even though Brolly and Mc Connell admit to having no lucky charms or shamrocks hanging around, one has to wonder if the luck of the Irish did in fact rub off on their four-legged friends over the course of last year. Again, it may come down to what you believe in or not, but the one undeniable element about their story (tales of good fortune, pots of gold and folklore aside) is the fact they left one home and successfully created roots in another. 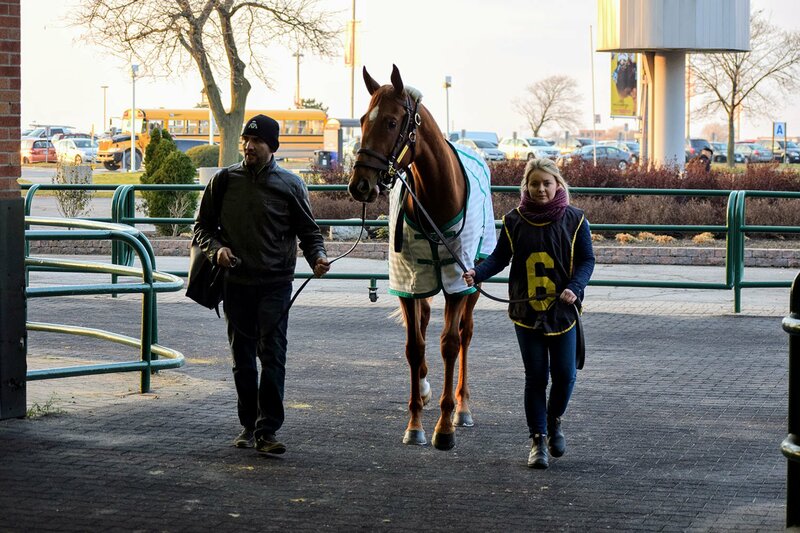 This entry was posted in Woodbine Insider and tagged 2018 Queen's Plate, Brian Mc Connell, Catherine Day Phillips, Dixie Moon, Horse Racing, Mr Havercamp, Nicki Brolly, Opening Day, Queen's Plate, Sovereign Awards, St. Patrick's Day, Woodbine. Bookmark the permalink.